I grew up in rural Kyoto. While studying in the UK I discovered rock climbing and the Scottish winters. Since then my passion expanded to alpine climbing and ski mountaineering, spending a few years based between France, U.S. Canada and Japan. I’ve been with Mountain Trip since 2011 guiding on Denali, and during the off season, I currently guide in the North Cascades, Hokkaido Japan and in Antarctica. 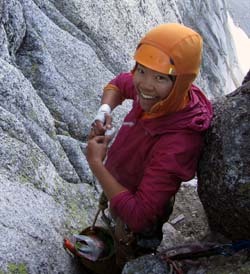 Otherwise, it’s great to be home climbing and skiing with my husband in the Eastern High Sierra and Tahoe area.